Terrell Scott is pictured at the top, left corner. 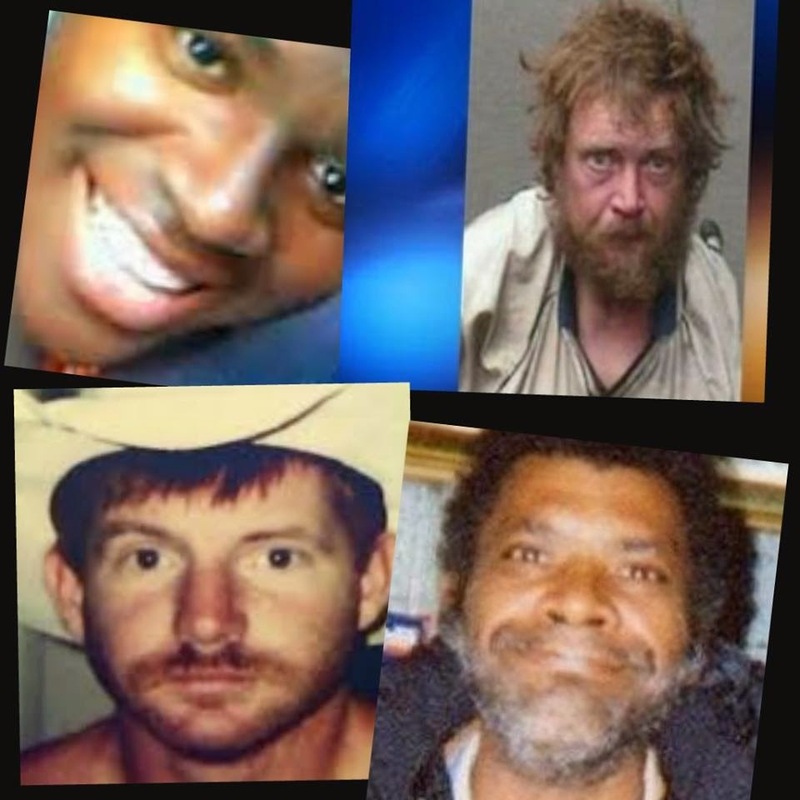 The other mental patients in this collage were killed under the color of law, including Larry Neal, bottom right. An attempt was made to kill a claimant to "AIMI vs. USA" a planned International Court civil action (this article will be repeated in comments plus read aloud on radio). "Assistance to the Incarcerated Mentally Ill ("AIMI") vs. USA" is a lawsuit to protect the civil and human rights of mentally ill Americans, which will be filed in 2015. More than 100 claimants are expected to use "AIMI vs. USA" to allege neglect, wrongful deaths, and prisoner torture, including long-term solitary confinement while denied visits for years or even decades. Blaring failures exist regarding the U.S. Constitution, the Universal Declaration of Human Rights, the Americans with Disabilities Act, the Civil Rights of Institutionalized Persons Act (CRIPA), the Civil Rights Act, the Convention Against Torture, and Executive Order 13107, implementing human rights treaties. Holly Alston, an "AIMI vs. USA" claimant, told the radio audience about the recent attempt on her life at "Assistance to the Incarcerated Mentally Ill ("AIMI") vs. USA" Blogtalkradio show dated March 26. "Terrell Scott, Too Crazy for Trial but Competent for a Plea Deal"
The Bar complaint against Lauer was probably received by the Bar on Monday during the first week of March. 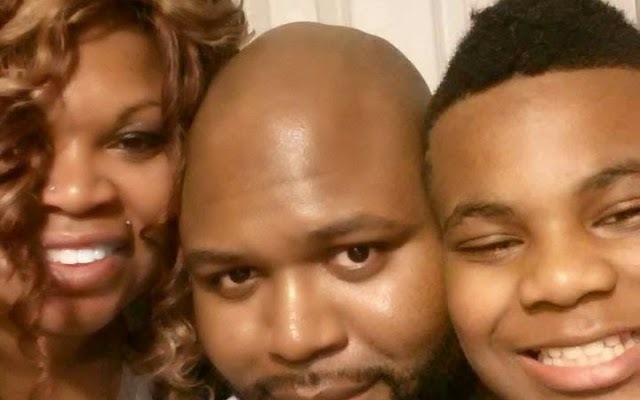 On the following Wednesday, a murder attempt was made on Holly Alston, Scott's mother, who vowed to continue to fight for her innocent mentally ill son's prison release until the day she DIES, if necessary. Alston drove her car home from work Wednesday afternoon without problems, but she heard strange noises as she drove and had trouble steering during a quick drive later that night. She canceled her trip to visit Scott because of this. When she reached her auto service company Thursday, the attendants notified Alston about the attempt on her life. The lugs had been loosened and were missing from her rear tire on the driver's side while the car had been parked in front of Alston's house. If Alston had tried to travel to visit Scott Wednesday night as she had planned, she certainly would have lost control of her car on the mountainous roads. "Somebody must really hate you," Alston's auto mechanic said. "AIMI vs. USA" claimants must recognize that a mentally ill inmate is worth an average of $4million to prison investors over the course of a life sentence (generally, persons with mental illness are excessively sentenced or re-sentenced while incarcerated to prevent prison release. See an article in "Dog Justice for Mentally Ill" blog about Damion Hayes, for examples). Trying to extract such persons from the prison industrial complex is froth with danger, but neglected and abused Americans must get up and stand up for your rights. Please don't give up the fight. It is useless to beg for human and civil rights from elitist slave masters like those who enslaved Africans and Native Americans for centuries, interned the Japanese in concentration camps, and made early European immigrants slaves and indentured servants. "Power concedes nothing without a demand; it never has, and it never will" ~Frederick Douglass. As director of Assistance to the Incarcerated Mentally Ill, and an advocate and survivor of murdered mentally ill heart patient Larry Neal, I became the most censored person in America years ago. I do not ordinarily share much information about my censorship and intimidation at this "Dog Justice for Mentally Ill" blog out of concern for my readers, some of whom have nervous conditions, and understandably so. However, I feel that all "AIMI vs. USA" claimants must know about the attempt on Holly Alston's life and that their concerns about being "targeted" are valid. News about "AIMI vs. USA" is apparently attacked by Internet companies or some government agency that has control over the Internet companies. Stalkers will not allow me to freely use my First Amendment rights to try to move mental illness away from the criminal justice system back to the health care arena, where mental illness should be addressed. My telephones and computers have been attacked and taken over. I have been refused assistance by federal authorities, which ignore my requests, and by the DeKalb County Police Department (one of my main suspects). In fact, a DeKalb County detective claimed that it is NOT illegal to censor Mary Neal. I also suspect the National Security Agency (NSA), which was given the right to wage cyber wars under NDAA, although my censorship precedes that law by years. 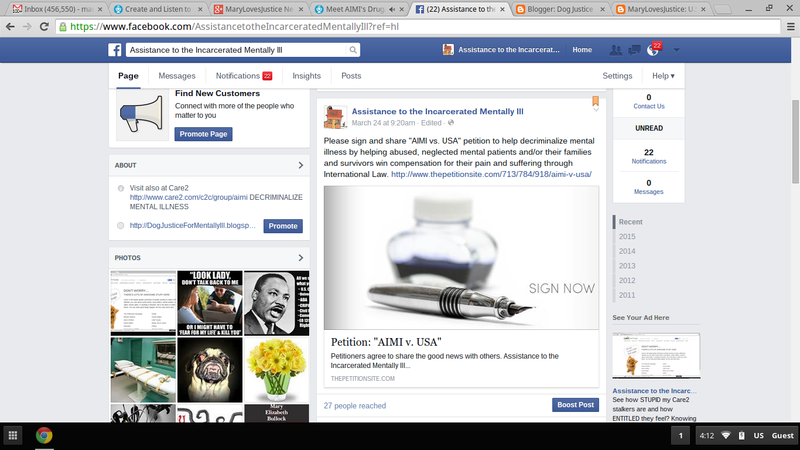 On March 24, I uploaded a petition at Care2 Petitionsite to announce "AIMI vs. USA," our International Court lawsuit on behalf of mentally ill Americans who endure negligence, brutality, and wrongful deaths. Today when I was not logged in at my computer, I browsed as a guest and discovered that Care2 or its stalkers had redirected the "AIMI vs. USA" petition link a "page-not-found" web page. 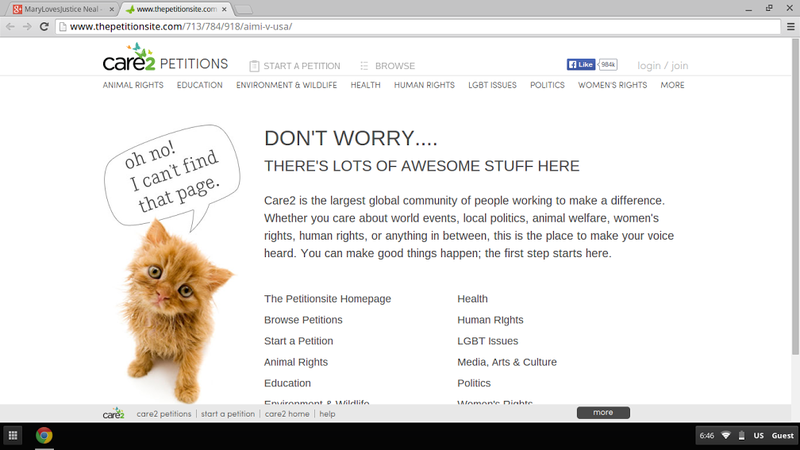 The link worked and signatures were coming in fast after publication on March 24, but on March 26, I was not allowed to see the petition which should have had many more signatures and comments. The petition stopped working when I added a film showing a mentally ill man being killed by Dallas police within seconds of their arrival at his home. The YouTube video https://youtu.be/-aALArJP4rw which Care2 censors is embedded below. The video above shows the June 14, 2014, fatal shooting of mental patient Jason Harrison, 38, who was killed while holding a screwdriver after his mother called 911 for help getting him to Parkland Hospital. Dallas police gave Harrison two seconds to respond to a command to "Drop that for me, guy." How was Harrison to know WHAT he was ordered to drop? It could have been his pants for all he knew. The police did not have time for giving clear instructions. They claimed they "feared for their lives." I plan to sue Care2 and other Internet companies about censorship that is used to prevent AIMI's advocacy for human rights. I hope that this time, a lawyer will come forward to represent me. That is my dream although I am perceived as being an "immaterial" black woman who challenges elite white supremacists' right to allow the abuse and murders of "useless eaters" in America. People have a right to know that federal court ruled that The (Johnnie) Cochran Firm's fraud against the Neal family was "immaterial" after Larry Neal's secret arrest and murder in Memphis Shelby County Jail in 2003. Americans cannot change negative circumstances they do not know about, and unfortunately, media companies refuse to report that The Cochran Firm claimed innocence by nonexistence (a new defense that probably only works for CoIntelPro). 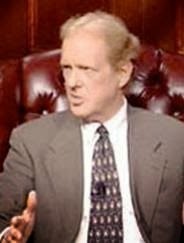 The Cochran Firm accepted contract as our wrongful death attorneys in a blatant conflict of interest immediately after Larry's death, then the lawyers did fraud and withheld legal services while the statute of limitations ran. The Federal Court order dismissing our case against the treacherous attorneys apparently means the Neal family's right to due process and Larry Neal's right to life are considered irrelevant in America. That fact has been reaffirmed in numerous deaths by police that have turned the USA itself into something of a concentration camp for Black men, homeless people, and mentally challenged Americans of every race. We are very thankful that there is an alternative for people who endure discrimination and violence: the International Court of Human Rights. If Care2 only values animal rights and human rights advocacy is unwelcome, it should have made that clear before I poured thousands of hours into building my advocacy group there from 2007 until 2010, when I basically conceded to CoIntelPro. I gave up when stalkers started aggravating some of my mentally ill members ferociously. I feared for their health and safety. Continuously provoking people who have diagnosed mental conditions is unwise, and the government or whomever hires stalkers should not do that to people who have lower tolerance levels. It was as though they wanted AIMI members to have breakdowns. If Care2 invests in prisons like Microsoft does, maybe that was its intention. The video embedded below captured stalkers preventing my ability to alert the public about U.S. congressional bill H.R.619. The mental health care bill was introduced by Rep. Eddie Johnson in January 2009 to resume Medicaid for mental hospital insurance but was denied news coverage from mainstream media companies. Resuming Medicaid insurance for psychiatric inpatients would threaten prison profits; therefore, my post about H.R.619 was not allowed to publish. No interference would have happened at Care2 if I had been advocating for pet insurance. Advocacy for lions, tigers, and bears is welcome at Care2, but advocacy for human rights for mentally ill and homeless people is treated like terrorism. 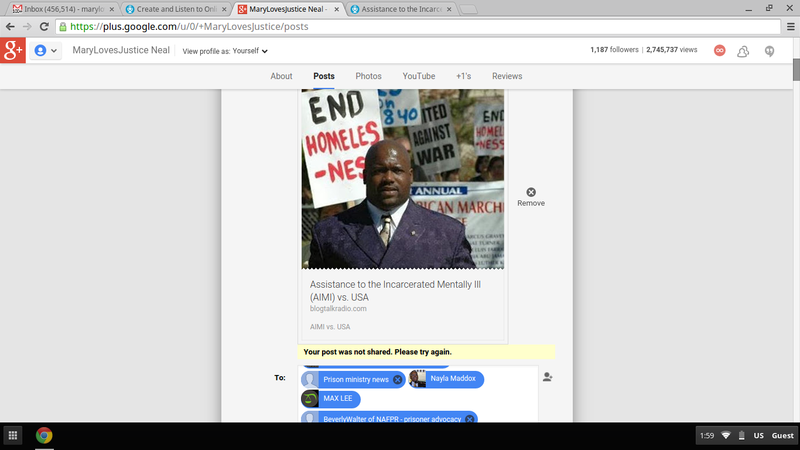 The video at YouTube https://youtu.be/mTnBUYoJtk4 (embedded above) proves that prison investors moonlighting as public officials seem to act in direct conflicts of interest to do or allow censorship against Mary Neal's advocacy to replace incarceration with hospitalization for mentally ill Americans. Stalkers virtually took over my AIMI group at Care2. At Twitter, my tweets about H.R.619 were published among tweets that had posted hours earlier in order to limit the number of people who saw my tweets. My censorship spans the entire Internet; wherever I go, I am censored, especially when I write about mental illness and executions. AIMI members and friends, now you know the ugly truth. Censorship is used to prevent your knowledge about crimes against humanity that are happening every day in America to our most vulnerable fellow citizens: people with acute mental illness -- not only to Blacks like Terrell Scott but also to whites like Kelly Thomas. We should demand prosecution of criminals who terrorize or attempt to murder parents who join "AIMI vs. USA" to win damages for pain and suffering. Potential claimants must find the courage to get up and stand up for their rights. Families of acute mentally ill Americans have a right to go to the United Nations' International Court to gain relief from torture in jails, hospitals, and prisons and to get restitution for wrongful deaths. We must be like slavery abolitionists of America's previous slavery era who demanded justice despite risks from angry slave masters. I sent an email to the United Nations last week to ask that the "AIMI vs. USA" director and claimants be given whatever help communicating that people in repressive regimes need in order to organize human rights lawsuits against their governments. AIMI needs protection from stalkers who control Mary Neal's phones and Internet access. Since stalkers attacked my email account at Gmail, one cannot swear the United Nations actually received the request. Judging by the amount of cyber stalking that is applied to this paragraph, it is unlikely that stalkers allowed the email to reach the U.N.
We will TRY to reach the U.N. by phone, but I have no way of knowing if whomever answers the call will actually BE a United Nations employee. Stalkers have frequently answered my calls and pretended to be the parties I called, and stalkers sometimes redirect calls I should receive to their residences or companies instead. Stalkers have already demonstrated their ability to redirect calls away from my Google Voice computer phone, my cellphone, my radio programs at Blogtalkradio, and my home phone (AT&T uses prison laborers and may be adversarial to decriminalizing mental illness). It disheartening that U.N. ambassadors also experienced privacy violations last year, possibly by NSA. Secretary of State John Kerry reportedly said, "Americans have a right to be stupid." AIMI believes Americans should have a corresponding protected right under domestic and international law to be informed. While the Care2 "AIMI vs. USA" petition was offline, I wondered if the reason AIMI's director could not access the petition was because potential claimants for "AIMI vs. USA" had written comments requesting help for starving prisoners or inmates who were otherwise at risk. Nikko Albanese was starving to death in a Florida prison before I published an article about his dire condition. The young bipolar man, who is nearly six feet tall and normally weighs 160 pounds, had dropped to a dangerous 120 pounds. Since AIMI exposed his dire circumstances, Nikko has reportedly been put on a high-calorie diet, and his mother was allowed to visit the SHU inmate for the first time in two years. A reported 346 inmates died in Florida's prison system in 2014 alone (that total may not include jail deaths). If that death rate was true for all 50 states, America's prison death total for 2014 would be 17,300 prison inmates. A total of 4,491 U.S. service members were killed in Iraq between 2003 and 2014. Therefore, America's 1.25 million mentally ill inmates are significantly more endangered than our battlefield soldiers. Risk to soldiers actually increases substantially after transitioning home. Thousands of U.S. veterans return home unscratched and become prisoners of war in America due to post traumatic stress disorder they contracted in battle. Many such veterans die because of neglect and abuse like Jerome Murdough, who was baked to death in Riker's Island Jail, and Anthony Hill, who was shot to death in DeKalb County, Georgia by police officer Robert Olsen as Hill jogged naked, unarmed, and harmless. Police have only to say, "I feared for my life," no matter how doubtful the assertion is. Thank you, Google and AIMI members, for caring about Nikko Albanese. I believe your interest helped to saved his life. Numerous mentally ill persons have already starved to death in America's correctional institutions in various states. If you need assistance, please contact me by phone at (678)531-0262 or by emailing me at MaryLovesJustice@gmail.com. Title the message "AIMI vs. USA," if you email me. Almost NO messages reach my inbox except from Facebook and other social media companies. Unless I know what to search for, I may never see your correspondence. Please see AIMI's article about Nikko in "Dog Justice for Mentally Ill" blog, which Google carried as a Google Alert (the blog's index listing all articles should appear on the left margin). 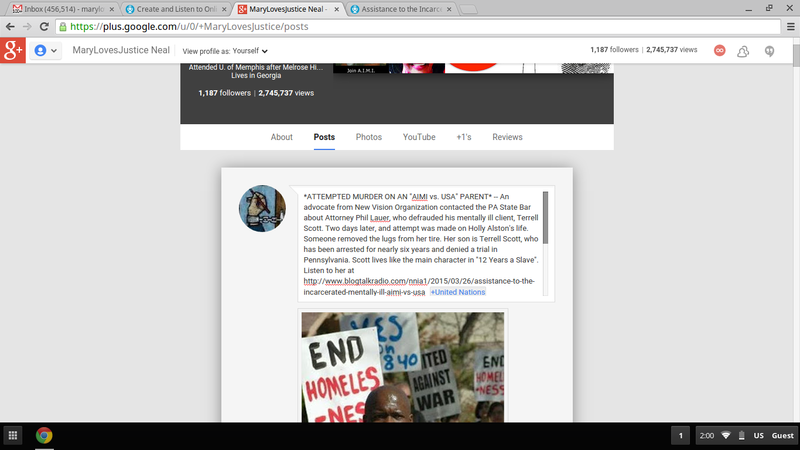 See more abuses and wrongful deaths of mentally challenged people, and please elect to "follow" this blog. It is extremely sad that an attempt was made on Holly Alston's life, likely by a prison investor who wants Terrell Scott to remain incarcerated indefinitely without trial as an opportunity to extract Americans' tax money. We must not be deterred by Nazis. AIMI claimants have to take a stand against oppression, especially because 1.25 million mentally ill Americans are imprisoned, and tens of thousands more wander our streets, chronically homeless and vulnerable. The homeless endure attacks from community members as well as police officers, and many are killed every year. The exact number is unknown, because police only report these tragedies to the Justice Department if it suits them. There are usually several mentally challenged people killed by police every day in America. Consider the deaths at the website "Killed By Police.net" to be a partial list. It only includes cases that got news coverage, and it omits all of the people dying in jails and prisons. Today, a 77-year-old man died who Birmingham police shot in February. The old guy had dementia like 107-year-old Monroe Isadore did when Arkansas S.W.A.T. killed him in 2013. Neither corrections nor law enforcement officers are likely to be prosecuted for mentally ill people's brutality and deaths, even if the deaths are ruled 'homicide' like Darren Rainey's and Daniel Linsinbigler's were. (Please Google Mary Neal with the name of each murdered inmate for more information). Every mentally ill person on death row and all families of executed mental patients should join "AIMI vs. USA" claimants. Executing mentally ill and seriously retarded people violates international and domestic laws, yet it is done in the United States regularly. Georgia executed three mentally ill people recently, and Texas makes killing mentally challenged Americans a hobby. This writer is especially concerned about Texas death row inmates Andre Thomas, who ate both his own eyes while in custody, and Jeff Wood, who Texas admits never killed anyone, but the retarded youth was sentenced under the law of parties. AIMI is also concerned about Scott Panetti, a man with severe mental illness who was convicted of murder while representing himself in court wearing a cowboy costume. It was a travesty of justice that officers of the court probably still find funny. Justice has failed the mentally ill and their families in the USA; therefore, we must seek help from the international community. "Why sit we here until we die?" ~Holy Bible. AIMI needs your energy and talent. Please consider working with AIMI as we continue advocacy for eliminating discrimination against people with serious mental illness. Call me at (678)531-0262 or (571)335-1741 daily between 11:00 am EST and 2pm EST to discuss becoming an AIMI volunteer. Emails should be sent to MaryLovesJustice@gmail.com. Please title your email "AIMI volunteer." We expect to have funding eventually, and all volunteer positions may eventually be salaried. Meanwhile, working as a volunteer gives excellent work experience in areas that one may not initially qualify for as a paid employee, and volunteering helps young people build their resumes, especially students. Retired professionals and unemployed people also find volunteer work meaningful and satisfying. Mental illness affects families from all socioeconomic backgrounds and all races, and there is work for everyone to do no matter who you are or what your educational level is. Consider working to improve life for millions of Americans through AIMI. If you need a letter from AIMI to officials on your behalf, please contact AIMI's director, Mary Neal. Diana Sprouse has volunteered to make phone calls and write letters on your behalf. You may have trouble accessing psychiatric treatment for yourself or a relative or letters to court or prison officials, etc. AIMI is here for you. AIMI will publish a fundraiser to invite your gifts to help AIMI have better computer technical assistance and part-time clerical help. AIMI hopes you will participate. We declare that Nazi Germany, which isolated and killed roughly 300,000 people labeled as mentally ill, was wrong in asserting that persons with mental health disabilities were "useless life." Instead, AIMI declares that ALL LIVES MATTER. We hope you will show that you agree by helping "AIMI vs. USA." Please begin by signing and sharing "AIMI vs. USA" petition, and please share a link to this article. This article has eleven(11) active links (including four email addresses), eight(8) photographs, and two(2) embedded videos. See if your right to receive the information is respected. How can you help? Follow this blog, and listen to the George Mallinckrodt Blogtalkradio presentations we taped January 11 and January 15, and again in March 2015. Mallinckrodt exposed brutality and a murder against mentally ill inmates in his book, "Getting Away with Murder," and was fired from his position as a psychotherapist in Florida prisons as a consequence of his objections to torture. Human and civil rights of persons with mental disabilities in the United States are treated as nonexistent. Your purchase of his book will help him regarding the loss of his salary for upholding human rights. It would be illegal to keep a dog in a tight space 23 hours a day and gas or Taser him for barking. It would be illegal to put a dog in deadly restraint for control. That happens to mentally ill people routinely in the nation's correctional facilities. What happened to Larry Neal? Why are we still asking that question after eleven years? Cover-ups regarding the wrongful deaths of mentally ill inmates and free people in the USA are common but vile, nonetheless.